I’ve tried repeatedly to get a shot of this card that is true to life. This one, shot in daylight this morning, is closer to the true colors, but it doesn’t show the gleam of the fil d’or of the matrix stitching. 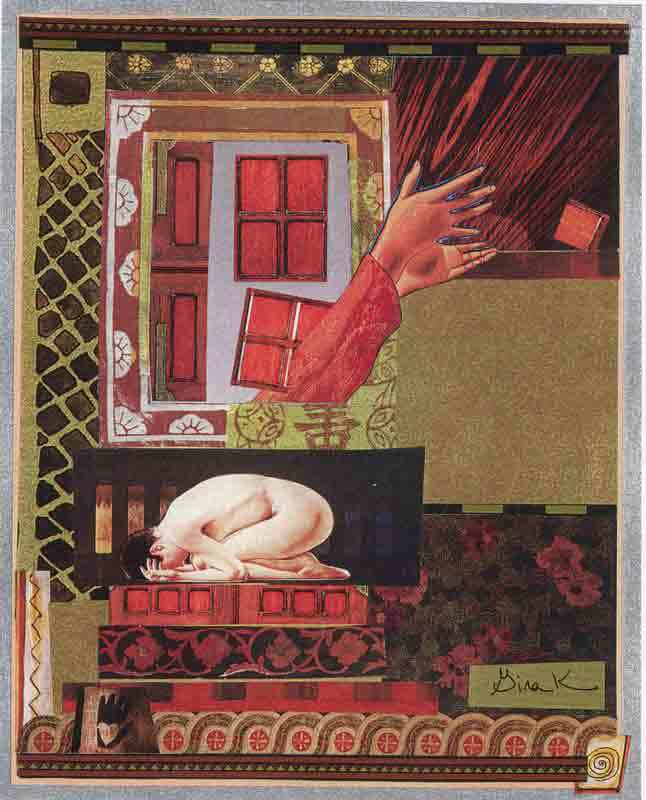 This little 4 X 6 inch card was made for my long-time pen pal, Gina. 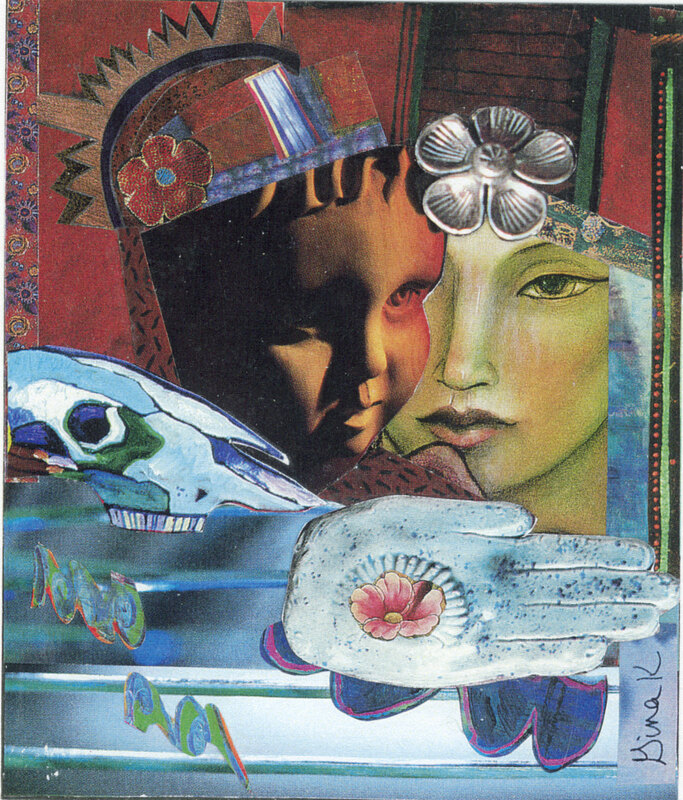 She first wrote to me in 1998, after learning that I, too, was housebound and disabled. 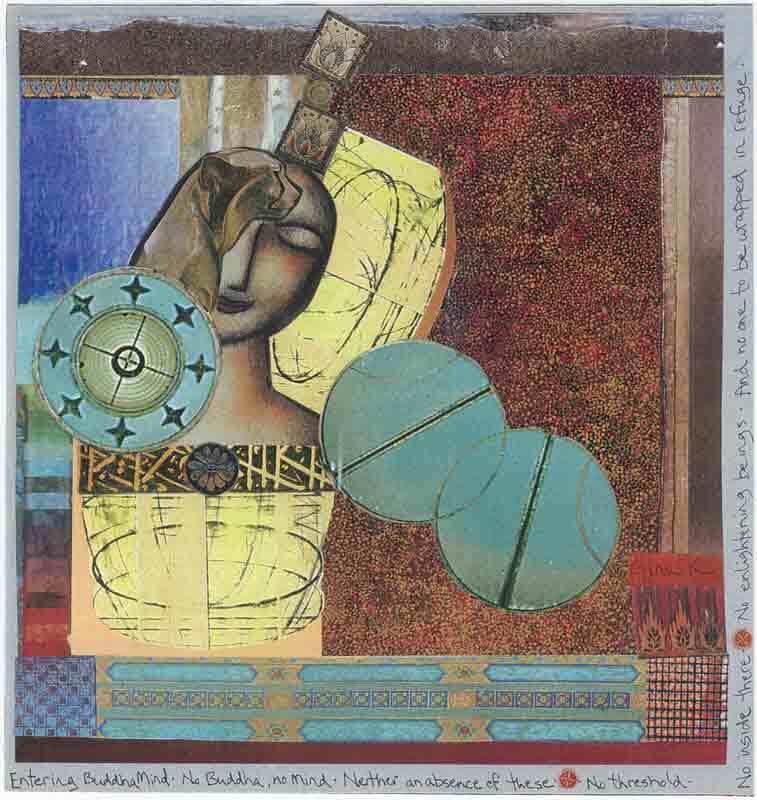 Gina became ill while she was a college art student and has never recovered. She’s now 52. In addition to ME-CFS, she also has Multiple Chemical Sensitivities and cannot tolerate being near computers. Thus, our correspondence has been entirely by USPS. Alone, she lives in a rented room with a make-shift kitchen and just barely manages to take care of her own basic needs. 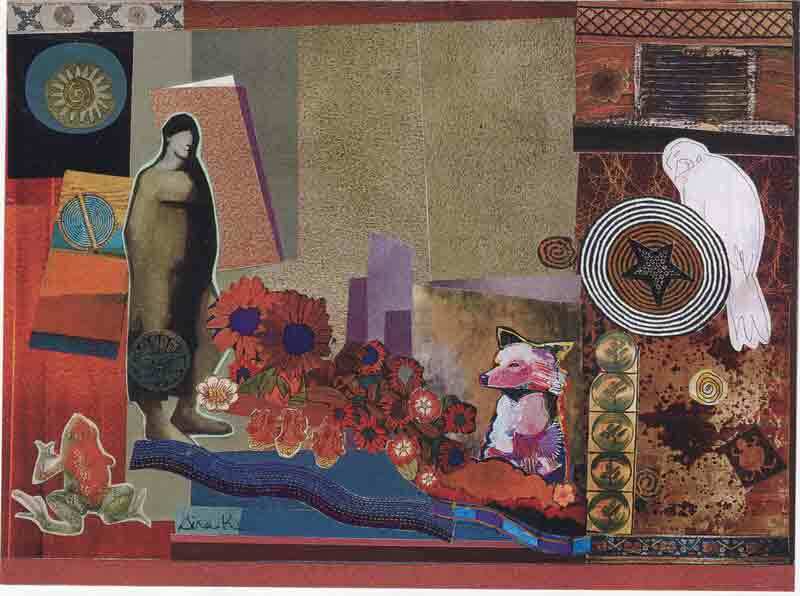 For a while, though, she was making paper collages. 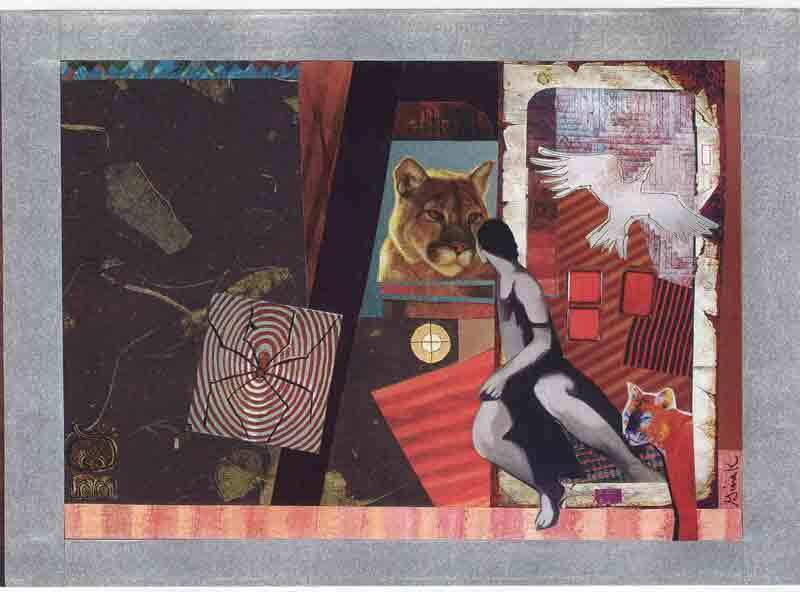 At irregular intervals, over the years, she sent me scans of her work. I had a hard time choosing which ones to show you, but I want you to see some of her work. Here are a few of them. Extraordinary, aren’t they? She also made this applique hanging that’s outside our apartment door. It was made before we met and before she became too ill to do such work. I don’t know what prompted her to give it to me, but I treasure it. Now she is not even able to make anything and I get only brief messages on note cards once or twice a year. If you leave a comment for her, I’ll print and send it to her. 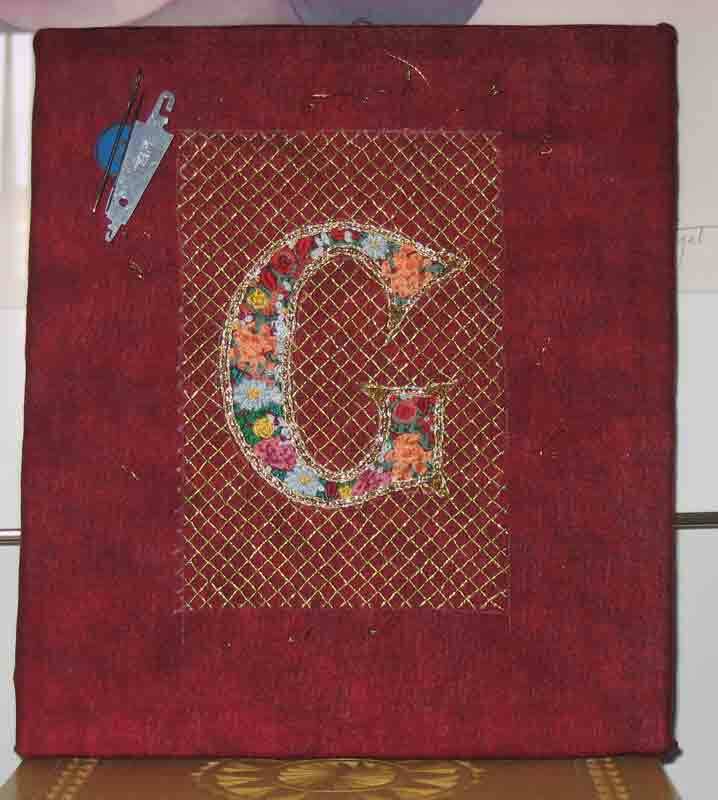 The card I made for Gina is based on a letter from the book Embroidered Alphabets by Gail Lawlor. 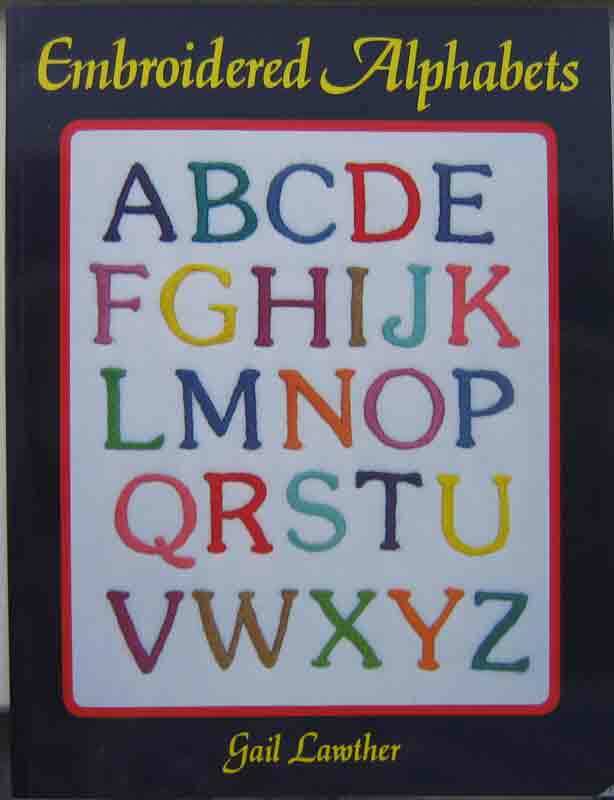 This is a handy book for any stitcher who wants to put words on her work. 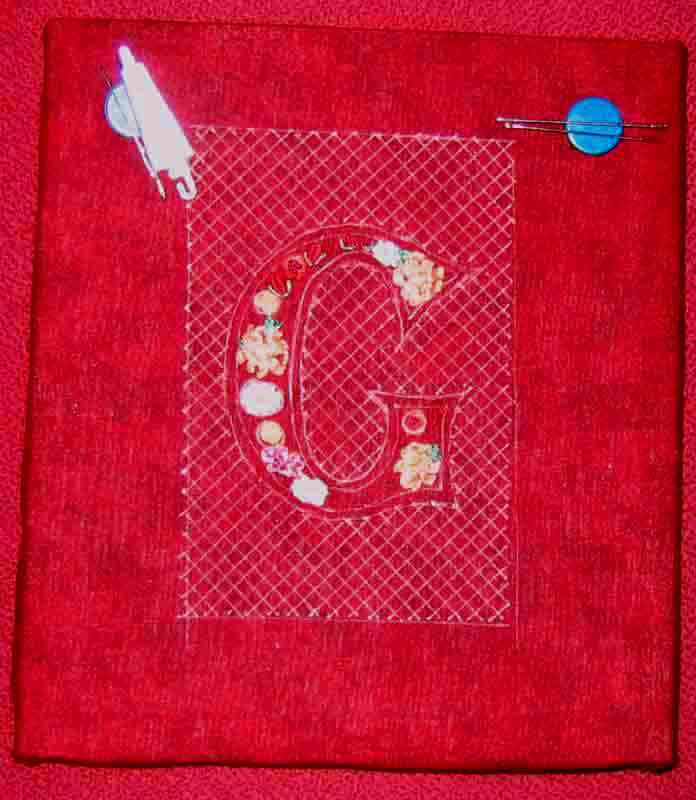 Besides a variety of alphabets, she offers lots of interesting and innovative ways to stitch letters. 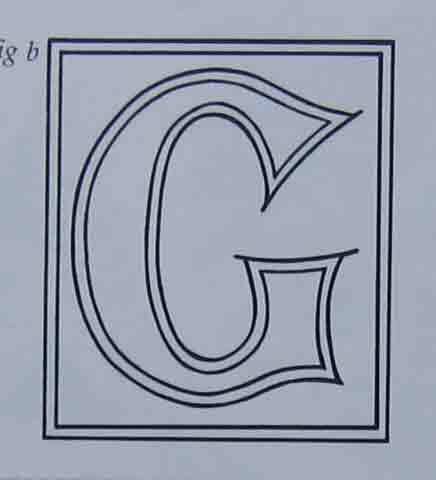 Here’s the letter G I used. Using this initial, I created a design and transferred it to cotton fabric I had backed with fusible HTWC for greater stability. 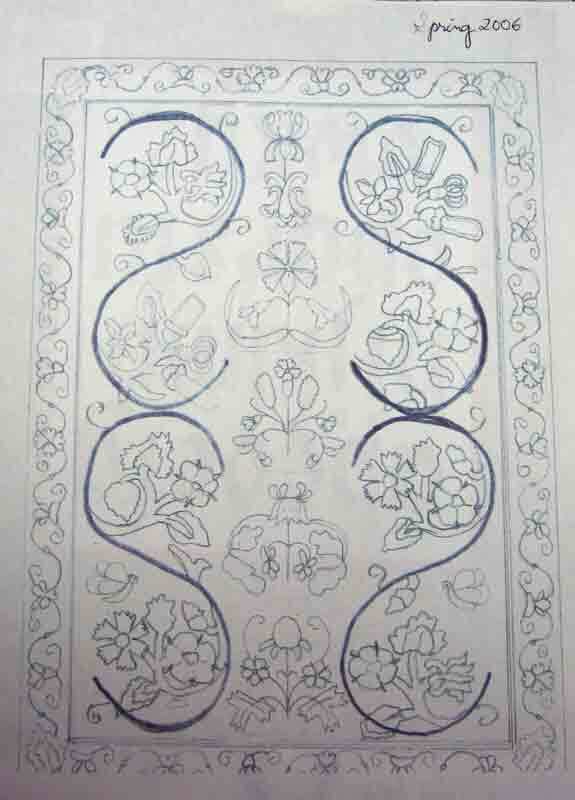 I put the fabric on my light table, over the design, and traced it with a white, water-soluble ink pen. This was the tedious part, but I’ve learned from experience that it’s the only way to get the threads spaced correctly. Even though this is a very small piece, I like working on fabric mounted on a stretcher-bar frame, especially for something like the matrix filling. The fabric must be tight and stable. 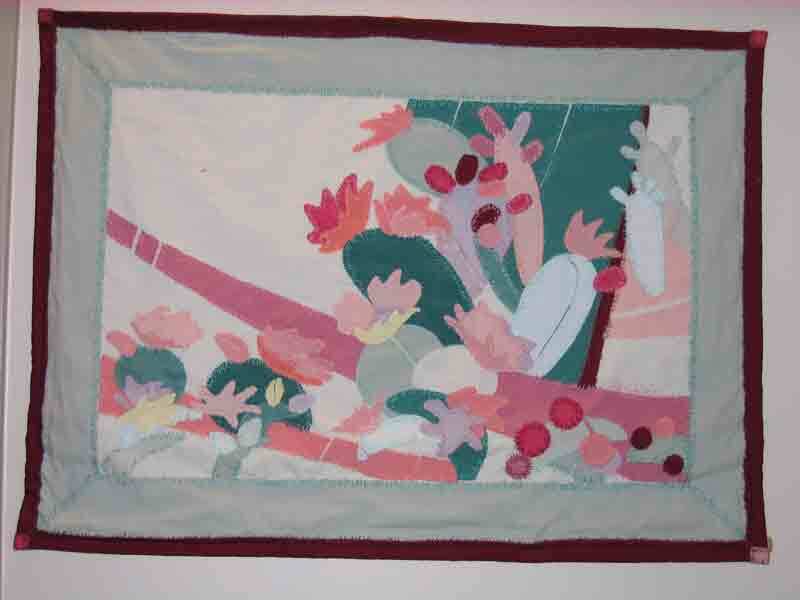 I began stitching with the salmon-colored flowers, then just kept adding, using silk ribbon, fine wool, #8 perle cotton, and cotton floss. I must have shot this with flash, which washed out the colors. Also, I should have put the frame on a different colored background, not my red desk-chair seat. 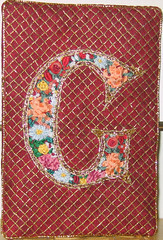 The outline of the G is three rows of couched metallic threads with some gold check purl chips at the points. The matrix filling is DMC metallic thread, tied down with the same thread. After couching a border of Rajamahal gold Rajcord and removing the fabric from the frame, I folded the worked area over a piece of Timtex, which I understand is no longer being sold. It was a gift from Kathy. 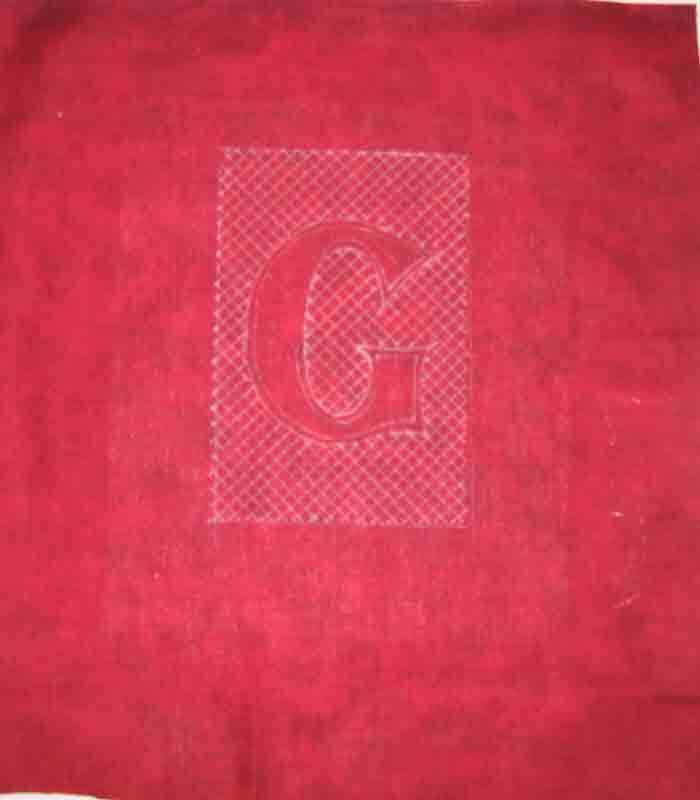 Then I made a backing for it of the same red cotton with a label that I printed on fusible cotton. To the back, I also fused Pellon fleece. Then I stitched the back to the front. Why is it not perfectly rectangular? Beats me. I measured and re-measured. 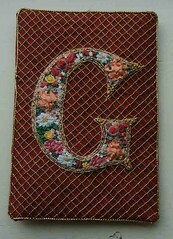 As you may know, a great many of my needlework pieces have been made as gifts. After I was forced to stop working and go into seclusion, my income dropped from six figures to zero . My husband was already retired and our only income was his retirement income. We couldn’t afford gifts for all our children and grandchildren, so I began making things for them. You may have read about that in my little story with pictures of some of the gifts I made years ago. It is a great joy to be able to make things with personal meaning for my loved ones. And now to get this card ready for the USPS. After Flickr told me that the upload had failed yesterday, I find today that the picture was posted, without any commentary by me. 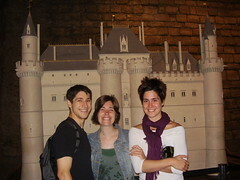 My grandson Caleb, his wife Lauryth, and her sister Sara are in Paris. Caleb is in a study abroad program, improving his language skills, while Lauryth and Sara are staying in an apartment in the Marais. You may remember that Caleb and Lauryth visited us in January and danced for me. Here they are shown in the medieval section of the Louvre. Two days ago I finished the particle physics course (for the third time) and I felt exhilarated. It is exhilarating to have some sense of how the world is made and how it works at the most basic level, but it is even more exhilarating to appreciate the human achievement of figuring out, understanding, proving experimentally, and then explaining these phenomena. After an afternoon of putting away supplies I’d been using and new stuff for my stash, and getting my thread stash and beads re-organized, I’m ready to get back to working on designs. My son Pete brought grandson Noah for a visit on Sunday. Here’s Noah about to leave. We had a great time, which means I am in recovery. No stitching going on here for the past week. Unlike many of my fellow needleartists, I am unable to stitch every day. I tried it for a year and found that I missed doing other things. Since I can be active only five hours a day, which includes hygiene and meal preparation, I don’t have much time for doing anything else. If I use that couple of hours for stitching, I’m not reading, studying, or writing much. A couple of weeks ago I began a Teaching Company course, Particle Physics for Non-Physicists. When I found I couldn’t listen to the lectures while stitching (both required my full attention), I took a break from the course to finish my S block. This week, I’m concentrating on the course. I’ve been interested in physics for at least ten years and read quite a lot about quantum mechanics about 12 years ago, when our granddaughter told me she was going to major in physics. She didn’t, but I became very interested anyhow. Now my grandson is a senior at university, majoring in physics, intending to pursue the PhD. When The Teaching Company offered me a deep discount on physics courses, I took the bait and bought this one and one on string theory. I’ve been through the 24 lectures once. Because I learn better by reading than by listening, especially to new material, I have also read the course book, which is almost a verbatim transcript of the lectures, and I made myself a vocabulary list. So many new words to learn! Now I’m halfway through the lectures (on DVD) a second time, and I’m really excited about what I’m learning. Because I understand so much more, it’s fun. What’s more, the professor is brilliant, a gifted lecturer and teacher, and good-looking besides. Particle physics is the most fundamental branch of physics–the study of subatomic particles, the basic building blocks of nature, so far as we know now. Next month the Large Hadron Collider at CERN (in Europe) will start up and physicists will be able, for the first time, to attempt to observe the last unseen particle–the Higgs boson, which is thought to be responsible for holding all the rest of the stuff together. I don’t mean to say that the fundamental particles of nature have been seen, but that overwhelming evidence of their existence has been found. The LHC has been in the works for decades, so it is a BIG DEAL for the physics world. Well, I don’t imagine that you, dear reader, have much interest in physics, but I just wanted to let you know that I am not sick or idle. I’m feeling very well and enjoying studying, getting a mental workout. I’m also enjoying being able to “talk” via e-mail with my grandson about physics. But I am getting restless about not making anything (except dinner). 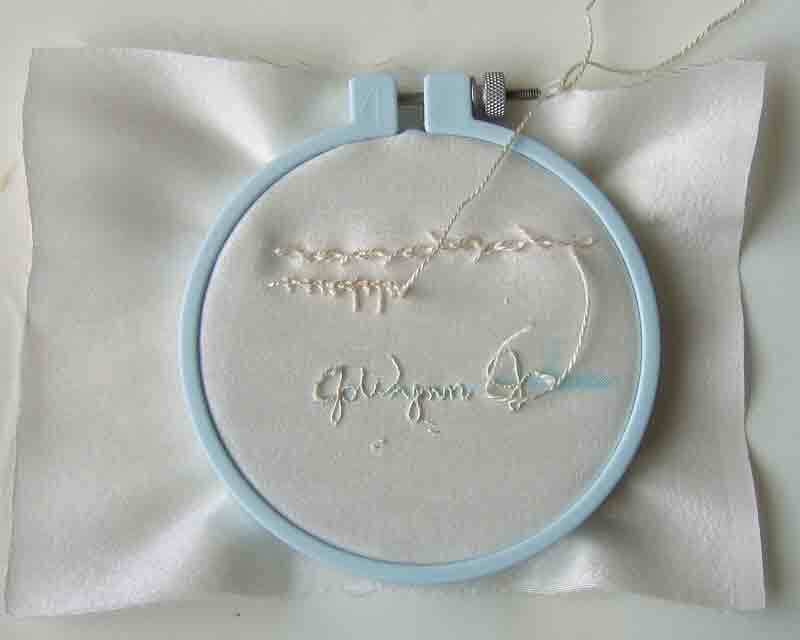 I have three projects in mind–the next design in my series of S embroideries is one of the them. I have the design I did two years ago. 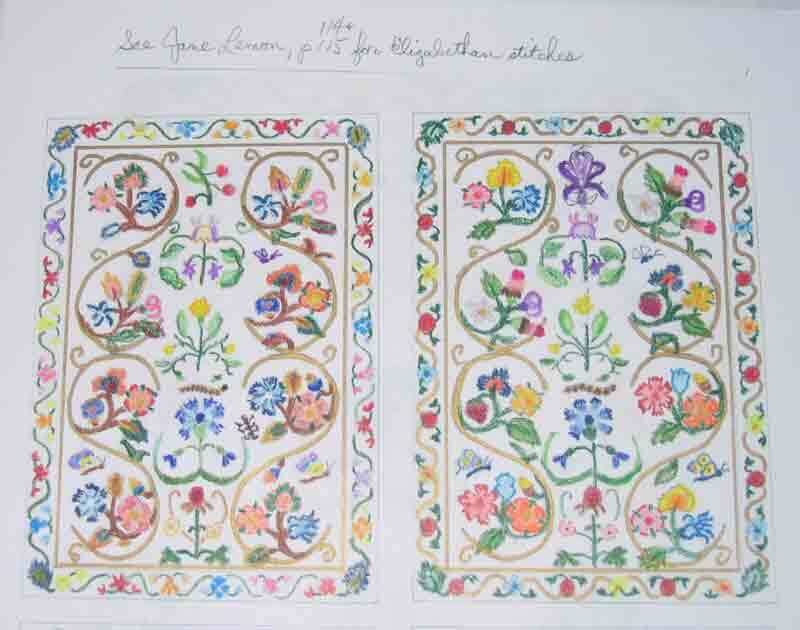 I wanted to do Elizabethan embroidery, which I had researched. 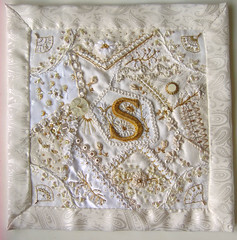 The S shapes, of course, would be in gold metal threads. I also did some thumbnail color experiments. 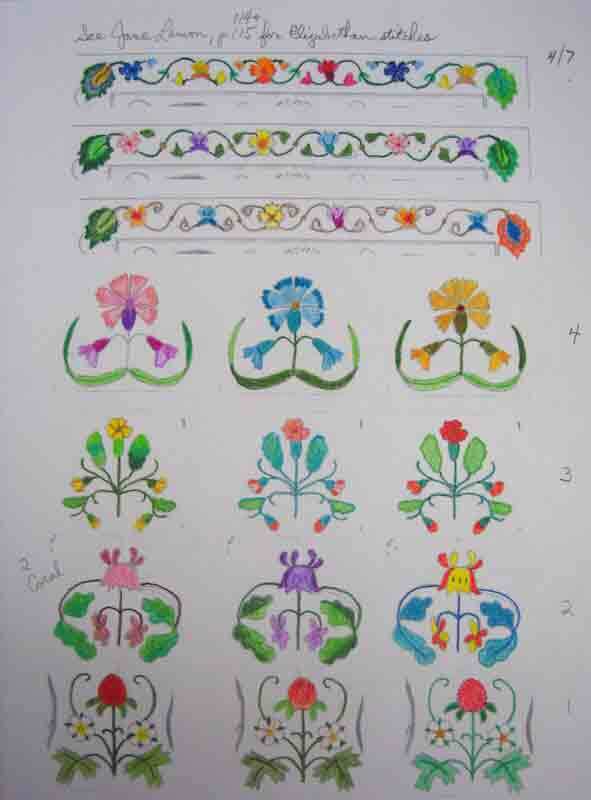 And some color experiments with the motifs. But I’m no longer pleased with these ideas. I’ve learned a lot in the past two years, and now I want to design something more contemporary, still using Elizabethan stitches and style. Is that possible? We’ll see. The other projects I have in mind include a small gift for a long-time pen pal who is severely disabled by ME and Multiple Chemical Sensitivities and I want to embellish a jacket for myself. Since I work VERY slowly, having three such projects before me is ambitious, to say the least. We’ll just see what I actually do. It will be one at a time, that’s for sure. A few more lectures to go, with my design ideas and needleart books in view, and then I can get back to stitching, or at least, planning stitching. For over a dozen years, I have been buying clothes from Marketplace India a woman-owned catalog business selling clothes made and hand-embroidered by village women in India. You can see me in one of their outfits, dressed for my birthday celebration. The company trains poor village women in the skills required to make the clothes. Thus, they can earn income that makes them self-sufficient, enables them to pay for schooling for their children, and helps prevent domestic violence, as their husbands have more respect for them. Take a look at their online site (See above.) The clothes are unique and beautiful. Mostly cotton, and very comfortable to wear. And with pockets in almost everything! Now I’ve met a woman through Stitchin Fingers who does Indian embroidery as wearable art. Since I want to embellish a jacket for myself, I expect to find useful ideas at her site. 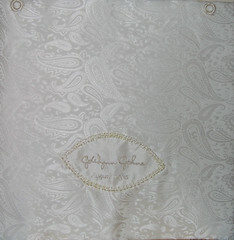 Do go see Chitra Gangadharan’s blog and her beautiful stitching on clothing. Here’s the finished block, after 115 hours of stitching since April, not including the design process. Try as I may, I could not get a picture that shows the gleam and play of light on the silks, golds, and pearls as the piece actually appears. Further down, you can click on the Flickr pictures for better views. 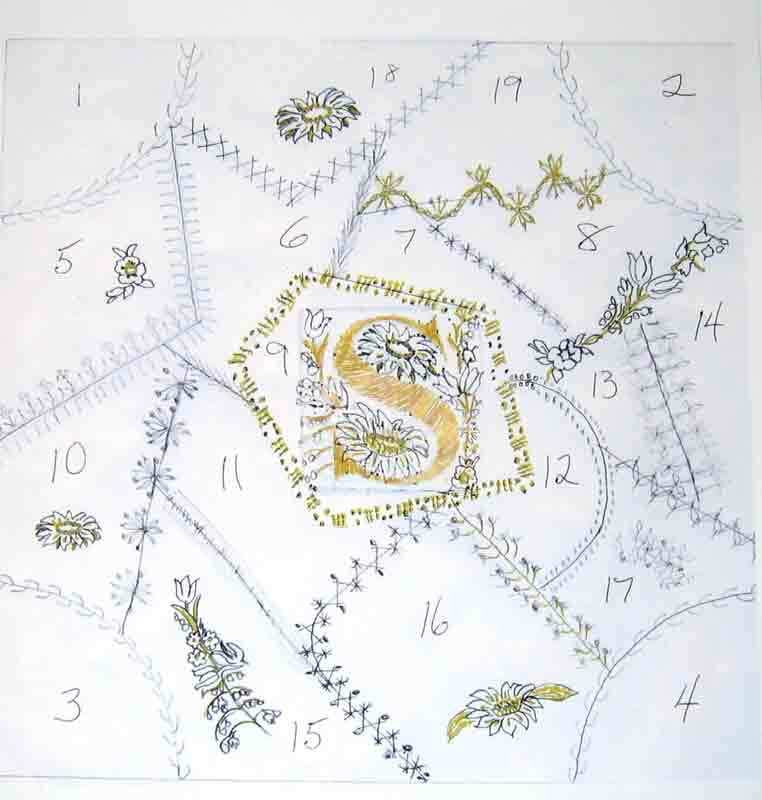 This project began in 2005, when I first conceived the desire to create a series of embroideries on the theme of the S shape. 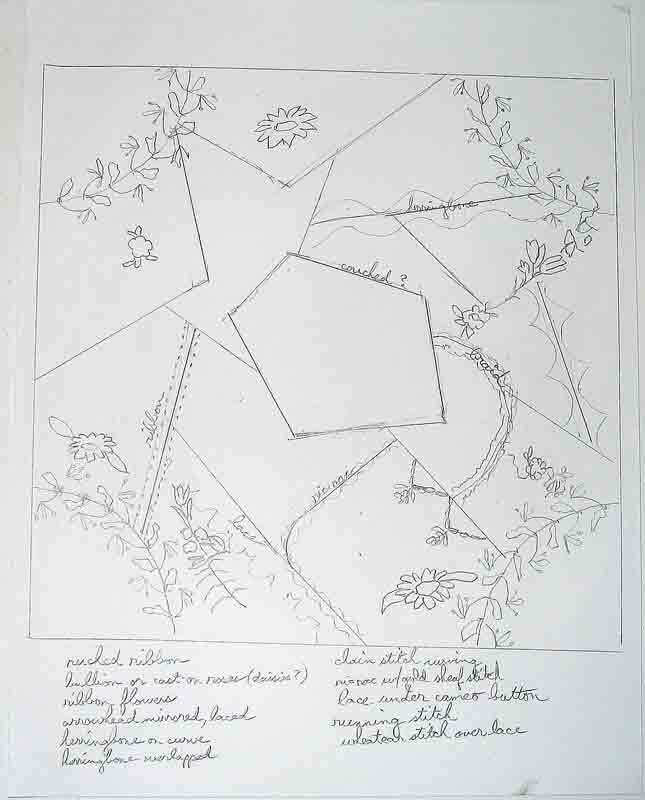 For several years, I had been thinking about words that described my life as it had become–housebound and very limited; and all the words began with S. In fact, I began a Mind Map to collect my ideas as early as 2004. 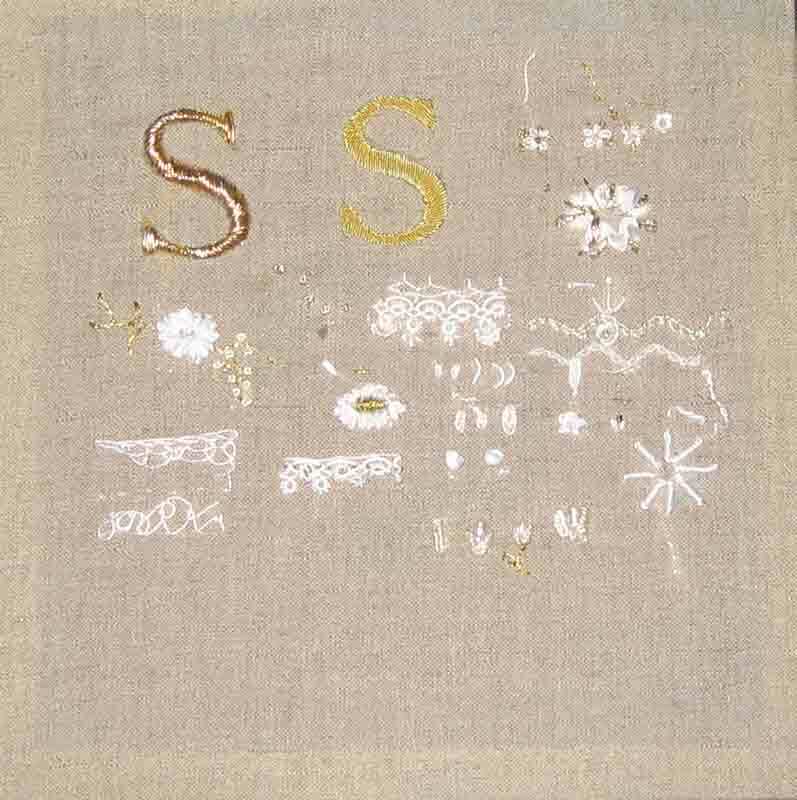 At the time I got the idea to make embroideries using the S shape in the designs, I was listening to Bach Partitas, and I thought I would like to make a stitched “partita”–a set of variations on a theme. But it was not until 2006 that I got to work on the idea seriously. By this time I had 14 S words that I wanted to make embroideries for. I developed the specifications for what I wanted to produce and then began designing. 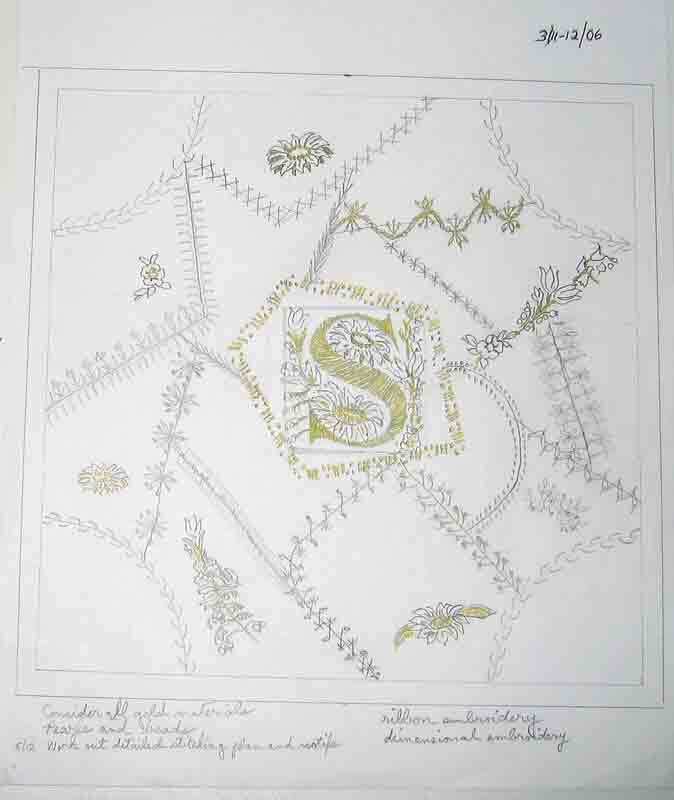 For a few months in 2006, that was all I did–research, doodling, and making finished designs for stitching in various techniques. Then life intervened, and what with making wedding, graduation, birth, birthday, and other gifts; and taking several online courses, I didn’t do any more work on this project until April of this year. Here is the first of the 11 designs (of 14) I have completed for this project. I did this in March 2006. You may be able to see the date in the upper right corner. In May 2006 I wrote some notes at the bottom about techniques and materials to consider for this design. When I went back to it this year, I drew in some more tentative ideas for seam treatments, just preliminary sketches, and wrote some more notes about stitches and materials I wanted to use. I had learned a lot since 2006, and I was eager to use my new skills and knowledge on this long-term project. 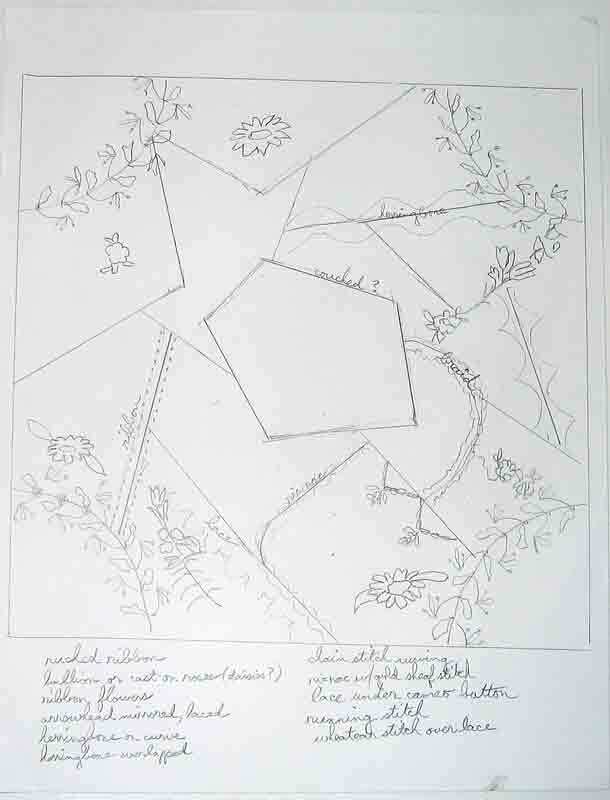 If you’ve been following along, you may remember that I used my first drawing to make patterns for the patches. It takes me so long to stitch things partly because I lack the skills and experience to do what I want to do. With every piece I make, there’s a practice cloth. Here’s where I tried out stitches, threads, and other materials for this block. I should have done a lot more practicing and trials on this cloth because I unstitched and reworked many parts of the block. While I was struggling with this block (I do much better stitching from a design and complete stitching plan than making it as I go), I had no idea how I would finish it. I didn’t want to frame it. After asking Barbara Curiel about how she had finished this block (thanks, Barbara), I remembered how I had finished the quilt I made for grandson Noah. There I used my old denim skirt for the backing, folding it around the front to form a border or band. 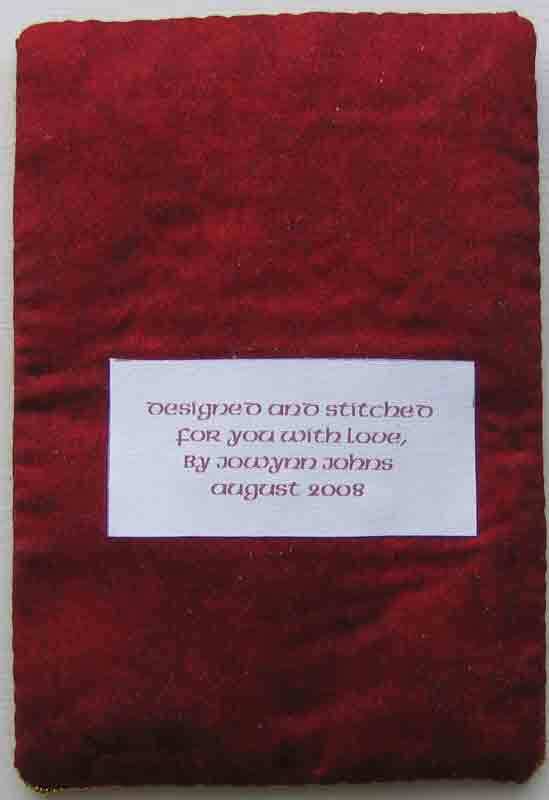 I stitched my signature and the date and attached that label to silk brocade which I then backed with Pellon fusible fleece. Believe me, getting that silk to fold into mitered corners was not like working with denim. I spent three hours on that alone, and still the corners are not perfect. But it is as good as I can make it. I used silk floss to buttonhole over bone craft rings for hangers. 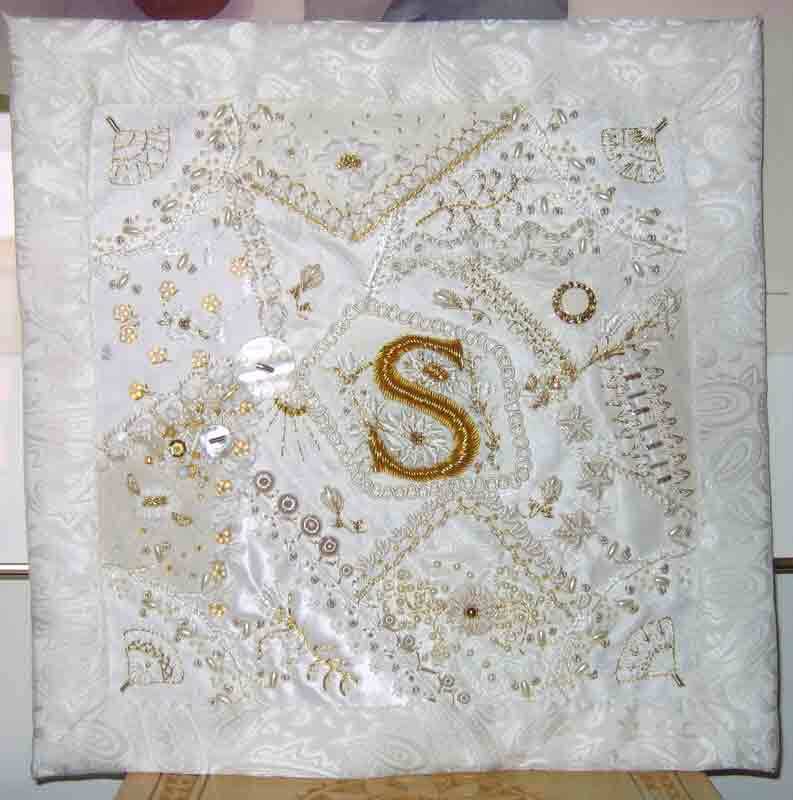 This block is entirely hand-stitched. I’m not sure this is a better shot, but you can see more detail if you click on this image. You can also enlarge it by clicking on All Sizes above the Flickr image. And I’ve left notes on that image about some of the details for those who may be interested. After thinking about this project for so long, I can hardly believe I’ve actually finished it. 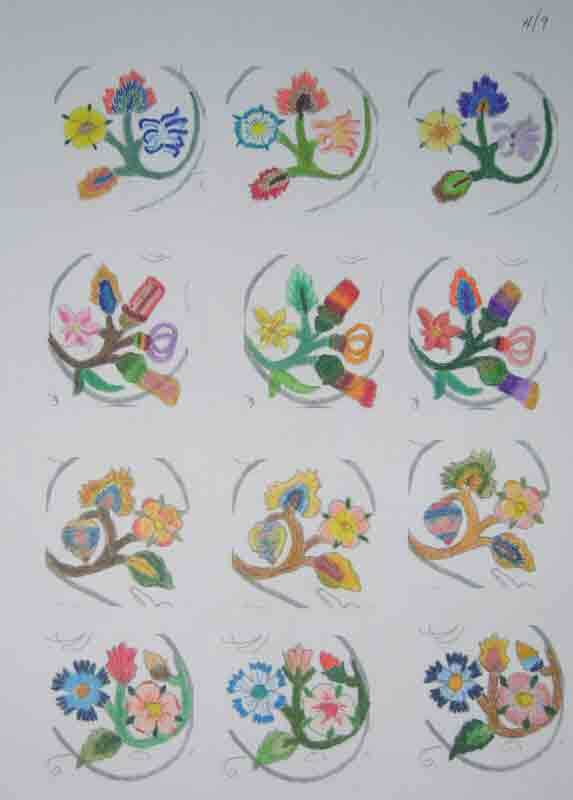 That is, I’ve finished the first of what I hope will be 14 embroideries, each in a different style. Will I live long enough? 🙂 The next one will not be crazy patchwork, much as I love doing that.